Stand-up comedian Noam Shuster-Eliassi is the daughter of an Iranian-born Jewish mother, and a father who was born in Jerusalem to Holocaust survivor parents from Romania. A month ago she was named “Best New Jewish Comedian of the Year” in a competition sponsored by London’s JW3 Jewish Community Center. Much of her comedy relates to her atypical Israeli upbringing and lifestyle. As a tall, dark-skinned woman who speaks Hebrew and Arabic fluently, with a name that is more commonly a boy's name, she entertains audiences with stories about her grandmother, parents, and cousins. Recently, comedian Noam Shuster-Eliassi gave one of her most fraught standup performances in East Jerusalem, before an entirely Palestinian audience. 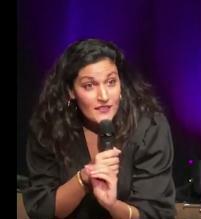 After the standup comedian who had invited her there, Amer Zahr, introduced her to the audience (“Today for the first timewe have a Jewish sister with us”), the tension reached a peak, she says.